– Trotsky, Why I Agreed to Appear Before the Dies Committee, 1939. – Lenin, Speech delivered at a joint meeting of the All-Russian Central Executive Committee and the Moscow Soviet, 14th May 1918, Collected Works, Vol. 23, p. 9. “At the moment when it seized the power and created the Soviet republic, Bolshevism drew to itself all the best elements in the currents of Socialist thought that were nearest to it’. Can there be even a shadow of doubt that when he spoke so deliberately of the best representatives of the currents closest to Bolshevism, Lenin had foremost in mind what is now called ‘historical Trotskyism?’ . . Whom else could he have had in mind?” (Trotsky, 353). “Trotsky, whose whole history stamped him as an unstable petty-bourgeois radical and who did not join up with the Bolsheviks until 1917, was a confirmed factionalist and opportunist. Even after he joined the party, he continued his opposition to Lenin on many points. When Lenin was in his final illness, during the autumn of 1923, Trotsky made a bid to capture the leadership of the Communist Party. He gathered together the several small opposition groups then in the party and issued an oppositional program, the ‘Declaration of the Fourty-Six’. The substance of this was to accuse the party leadership of gross bureaucracy, to instigate the youth against the party, to pronounce the N.E.P. [the New Economic Program in the Soviet Union which was began by V.I. Lenin. -Author] a complete retreat, to demand freedom to build factional groupings, to condemn the party for the defeat of the German and Hungarian revolutions, and blame the many economic difficulties upon party mismanagement, and to pronounce the Russian Revolution itself in a state of ‘Thermidorean degeneration’…” (Foster). “…the fate of the Revolution in Russia [was] at stake…[and also] the world communist movement. A victory for the Trotsky forces would have been a decisive success for the world reaction” (Foster). “…Trotsky, who had been expelled from the Soviet Union in 1929, organized abroad the ‘Fourth International’ in 1933, which was composed of skeleton groups in many countries. Among it’s other counter-revolutionary activities, it openly advocated the violent overthrow of the Russian Communist Party leadership and the Soviet government. In Spain, China and elsewhere, Trotskyites were proved to be police spies. [This last sentence was footnoted with a reference to the ‘Communist International’, January, 1939 -Author]” (Foster). In exposing the Trotskyites, Lenin observed that “they make out all the time that what they ‘want’ and what are their ‘opinions’, interpretations, ‘views’ are the demands of the working-class movement.” This he saw as “one of the greatest, if not the greatest, faults (or crimes against the working class) of the…Trotskyites.” (Lenin, CW #17 382) When we consider the actual objective class forces instead of Trotskyite phrase-mongering, we learn that the Trotskyites attempted to disrupt the united front against fascism and, in this way, they objectively aided world reaction. “Not for nothing did the founder of the Italian Communist Party, Antonio Gramsci, when he was in prison and found out that some of the political prisoners were in danger of falling under Trotskyite influence, transmitted his laconic warning through the prison cells: ‘Trotsky is the puttana [a vulgar word for a prostitute] of fascism” (Togliatti 210). 1) Marxist-Leninists, unlike Trotskyites, do not attempt to “jump over” the various stages of revolution. Marxist-Leninists, unlike Trotskyites, believe that necessary objective conditions must be present before advancing to the socialist revolution. Leon Trotsky advocated “jumping over” the bourgeois-democratic revolution in Russia and proposed leaping immediately to the proletarian revolution. History confirms that Trotsky’s line would have condemned the proletariat to isolation in Russia’s bourgeois-democratic revolution and set back the struggle for socialism. 4) Marxist-Leninists, unlike Trotskyites, are not orientated on “revolutionary wars which export revolution” that do not take into account the objective class relations within a given country. Marxist-Leninists understand that revolutions mature when the class contradictions within a given country are heightened to the point of national crisis and do not believe that revolution can be spread “by red bayonets” from the socialist countries. It must be pointed out that Leon Trotsky advocated provocations which would have proved disastrous to the Soviet Union. Lenin showed that “[Trotsky’s] ringing phrases about ‘revolutionary war’ served as a screen for petty-bourgeois adventurers, who objectively were helping the enemies of the revolution. Addressing the supporters of ‘revolutionary war’, he announced: ‘…In your objective role, you are a tool of imperialist provocation. And your subjective ‘mentality’ is that of a frenzied petty bourgeois.’” (Lenin, CW #27 330). “The history of the ‘Fourth International’ was the history of wrangling and squabbles between the ill-assorted Trotskyite groups [….] The ‘Fourth International’ was knocked together [in the 1930s] on the basis of an ephemeral union of several Trotskyite groups, who had no sort of organizational ties apart from their statement that they belonged to this ‘International.’ [….] They were recruited, as a rule, from among persons who had been expelled from the Communist parties, or from a variety of adventurers with anti-communist leanings. Every type of renegade, attempting to hide his hatred of the Soviet Union and the Communist parties with a ‘left phrase’, could find a welcome there. They came predominantly out of the petty-bourgeois and bourgeois intellectual circles as far as their social status was concerned…” (Basmanov). “He [Trotsky] considered the Great October Socialist Revolution merely as a jumping-off ground for carrying the war into the capitalist world. In his view, the October Revolution could only influence the march of world history if it could immediately provoke, ‘stimulate’ and ‘push’ revolutions [militarily] in the whole world…” (Basmanov). “…Trotsky also asserted that the Russian proletariat was not ready for revolution, and therefore it would be no great loss if it was unable to sustain a fight with the bourgeoisie. He said: ‘A bourgeois victory against us would be a blow to the revolutionary movement in Europe, but it would not be comparable to what took place after the Paris Commune…The European proletariat is more ripe for socialism than we are. Even if we were destroyed, there is not the slightest doubt that there could not be such a historical gap as there was after the Paris Commune’” (Basmanov). “Lenin convincingly proved that these views had nothing in common with Marxism, which rejects the ‘pushing’ of revolutions. Revolutions mature in the first place when class contradictions within a country are exacerbated to the point of national crisis” (Basmanov). “’The bible on their tongues, and malice in their hearts’ used to be said earlier of hypocrites and pharisees, who disguised their wicked deeds and vile intentions by alleging that they were moved by the desire to defend the interests of their religion. This is more or less how Trotskyites have behaved and behave now. “Present-day Trotskyites try to present themselves in their propaganda as ‘consistent followers of Marx’. This trick has obviously been calculated to impress those who know little or nothing about the long-drawn-out struggle which Marxist-Leninists have waged and are waging against the Trotskyites, who are the confirmed enemies of the revolutionary cause” (Basmanov). Trotskyism seems to take on pseudo-leftist slogans, but in reality has no place in the workers’ movement. As a result, Trotskyism has been at no front of revolution like the so-called “Stalinists” in the Third World. This is due to the nature of the parties that tow a Trotskyite line. Very few leadership roles are actually proletarian in nature but in fact are petty-bourgeois or bourgeois intellectuals who naturally impose their views on the proletarians. Those claiming to be Marxists must continue to educate and struggle against the widespread falsification of history that is occurring due to the purposeful efforts of the Trotskyites. This work is by no means to be considered a comprehensive history of the betrayal on the part of Trotsky himself or his present-day followers. We positively cannot present a complete and total examination of their views in one work. A book of considerable length would be required for such an undertaking. Instead, we seek to give a quick and hopefully convenient summation of Trotsky and Trotskyism’s past betrayals of socialism and quote key parts and examples of them. By doing this we aspire to impart some further knowledge as to the political history and goals of Trotskyism. The American Party of Labor hopes to make its thesis crystal clear: Trotskyism must be exposed as a reactionary and anti-working class ideology. Trotskyism is not Marxism and certainly not Leninism. It was actually on Lenin’s proposal that the Central Committee elected Joseph Stalin as General Secretary in April 1922. Leon Trotsky was a Menshevik who violently attacked Lenin and Bolshevism every step of the way until they seized power in Russia. Trotsky was the only major Communist Party leader who did not attend Lenin’s funeral. He was never considered for the position of leader of the Party. Trotsky’s program was defeated in a landslide at the 13th Party Congress in 1924 and at the 15th Party Congress in 1927, the latter by a vote of 740,000 to 4,000. Trotsky was expelled from the USSR and the Communist Party after trying to undermine the Soviet state with demonstrations and trying to create a faction in the Party after his program was defeated. Once exiled by majority vote, he planned coordinated sabotage and assassinations of Party leaders and called for a new revolution in the Soviet Union to place himself in power. He escaped to the West, where he served the imperialist powers, including the FBI and Gestapo until his execution at the hands of Ramón Mercader in 1940. “The old participants in the Marxist movement in Russia know Trotsky very well, and there is no need to discuss him for their benefit. But the younger generation of workers do not know him, and it is therefore necessary to discuss him. [….] Trotsky was an ardent Iskrist in 1901—03, and Ryazanov described his role at the Congress of 1903 as ‘Lenin’s cudgel’. At the end of 1903, Trotsky was an ardent Menshevik, i. e., he deserted from the Iskrists to the Economists. He said that ‘between the old Iskra and the new lies a gulf’. In 1904—05, he deserted the Mensheviks and occupied a vacillating position, now co-operating with Martynov (the Economist), now proclaiming his absurdly Left ‘permanent revolution’ theory. In 1906—07, he approached the Bolsheviks, and in the spring of 1907 he declared that he was in agreement with Rosa Luxemburg. In the period of disintegration, after long ‘non-factional’ vacillation, he again went to the right, and in August 1912, he entered into a bloc with the liquidators. He has now deserted them again, although in substance he reiterates their shoddy ideas” (CW 20, 346-7). “Trotsky, on the other hand, represents only his own personal vacillations and nothing more. In 1903 he was a Menshevik; he abandoned Menshevism in 1904, returned to the Mensheviks in 1905 and merely flaunted ultra- revolutionary phrases; in 1906 he left them again; at the end of 1906 he advocated electoral agreements with the Cadets (i.e., he was in once more with the Mensheviks); and the spring of 1907, at the London Congress, he said that he differed from Rosa Luxemburg on ‘individual shades of ideas rather than on political tendencies’. One day Trotsky plagiarizes from the ideological stock-in-trade of one faction; the next day he plagiarizes from that of another, and therefore declares himself to be standing above both factions” (CW 16, 391). “I cannot be called a Bolshevik… We must not be demanded to recognise Bolshevism” (Trotsky, “Mezhrayontsi Conference”). “Trotsky distorts Bolshevism, for Trotsky never has been able to get any definite views on the role of the proletariat in the Russian bourgeois revolution. Much worse, however, is his distortion of the history of that revolution” (CW 16, 381). 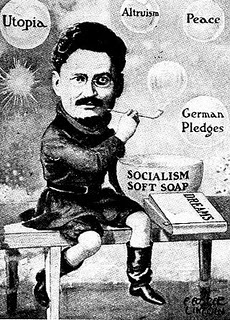 “reason why Trotsky avoids facts and concrete references is because they relentlessly refute all his angry outcries and pompous phrases […] Is not this weapon borrowed from the arsenal of the period when Trotsky posed in all his splendor before audiences of high-school boys?” (Lenin, CW 20, 346). The words of the father of the Russian Revolution carry over to this day when speaking of present-day Trotskyism. Like his followers today, Leon Trotsky was the friend of anti-Marxists. “Trotsky concentrated his energies on fighting Lenin, the Bolsheviks. He frankly stated that he saw this as the main purpose of his political activity. The congratulatory postcard to Joffe (1910) is sufficiently widely known; in it Trotsky urged ‘a great fight’ against Lenin, and threatened that in it ‘Lenin will meet his death.’” (Basmanov). “Trotsky threw up his hands, telling the Germans that he would never agree to what they wanted [in the Brest-Litovsk peace treaty] and urging Lenin to adopt a ‘no war, no peace’ policy in which Russia would neither continue to fight nor agree to Germany’s terms […] The Ukrainian capital of Kiev fell to the Germans on March 1. Trotsky, furious, said that Russia should rejoin the Entente and resume the war. Lenin, fearing the capture of Petrograd and the destruction of his fledgling regime, moved his government to Moscow and said no” (Meyer 619-620). “[A]fter Lenin’s death we, nineteen men of the Executive Committee, sat together and anxiously awaited the advice which our leader would give us from the tomb. Lenin’s widow had brought us the letter. Stalin read it aloud to us. As he did so, nobody made a sound. When it came to speak of Trotsky, the letter […] said: ‘His un-Bolshevik past is not an accident.’ All at once Trotsky interrupted the reading and asked: ‘What was that?’ The sentence was repeated. These were the only words that were spoken during that solemn hour” (Ludwig 364). “Czechoslovakia is one of the most monstrous national abortions produced by the labors of the infamous Versailles conference… Czechoslovakia’s democracy has never been more than a shabby cloak for advanced capitalist exploitation… This perspective necessarily entails the firmest revolutionary opposition to the Czechoslovakian bourgeois state, under any and all circumstances” (Kahn and Sayers 325). “[T]he bureaucracy can be crushed only by a new political revolution” (Trotsky, “The World Situation”). In addition to these quotes, an entire section of Trotsky’s famous tome The Revolution Betrayed called “The Inevitability of a New Revolution” is dedicated to supporting a revolution against the existing state of the Soviet Union. Trotsky claims he seeks to make this revolution in the name of “true” socialism. However, in calling for a revolution, he is advocating the overthrow and destruction of the existing state. The American Party of Labor believes the Soviet Union at that time was a socialist state in which the proletariat was the ruling class of society. Therefore, if one accepts this thesis, then clearly Trotsky’s plan was for the restoration of capitalism in the USSR. This would also be the dismantling of the Soviet state on the brink of invasion by fascist forces. If one needs further proof that Trotskyists are not communists, one only needs to look at their lack of preference for a socialist state over the bloodthirsty fascist regimes of Hitler, Mussolini, Hirohito and Franco. To further the bourgeoisie’s ends, Trotsky and his follows began the line of moral equivalency between fascism and communism. 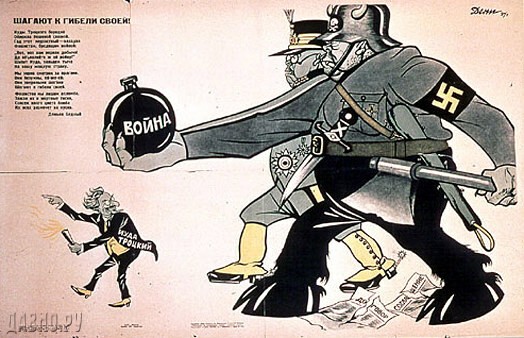 “In the second World War both fronts, the democratic as well as the fascist, are likely to be defeated — the one militarily, the other economically. No matter to which side the proletariat offers itself, it will be among the defeated. Therefore it must not side with the democracies, nor with the totalitarians” (Ruhle). “favorite charge of the Stalinists during this period was always that Trotsky allied with foreign powers to destroy the Soviet state. This was a bald-faced lie, as Trotsky always insisted that true Bolshevik-Leninists must unconditionally defend the historical gains of the October Revolution […]. Every single programmatic document of the Left Opposition, the International Communist League and the Fourth International proclaimed the unconditional defense of the USSR against capitalist restorationist forces and imperialist attack” (“Workers Vanguard”). “defense of the Soviet state required above all the ousting of the Stalinist regime which consistently sabotaged that defense” (“Workers Vanguard”). As the quotes mentioned earlier prove, it is amazingly apparent in Trotsky’s writings that he supported not defense of the Soviet Union, but rather terrorism and wrecking against it. “It is impossible to displace him except by assassination. Every oppositionist becomes, ipso facto, a terrorist” (New York Evening Journal). “After the experiences of the last few years,” he continued, “it would be childish to suppose that the Stalinist bureaucracy can be removed by means of a party or soviet congress. In reality, the last congress of the Bolshevik Party took place at the beginning of 1923, the Twelfth Party Congress. All subsequent congresses were bureaucratic parades. Today, even such congresses have been discarded. No normal ‘constitutional’ ways remain to remove the ruling clique. The bureaucracy can be compelled to yield power into the hands of the proletarian vanguard only by force” (Trotsky The Class Nature of the Soviet State). “[t]he Soviet population cannot rise to a higher level of culture without freeing itself from this humiliating subjection to a caste of usurpers. […] No devil ever yet voluntarily cut off his own claws. The Soviet bureaucracy will not give up its positions without a fight. The development leads obviously to the road of revolution” (Trotsky The Revolution Betrayed, 215). “Shortly before they left for Russia, Trotsky’s emissaries, Konon Berman-Yurin and Fritz David, were summoned to special conferences with Trotsky himself. The meetings took place in Copenhagen toward the end of November 1932. Konon Berman-Yurin later stated: ‘I had two meetings with him [Trotsky]. First of all he began to sound me on my work in the past. Then Trotsky passed to Soviet affairs. Trotsky said: ‘The principal question is the question of Stalin. 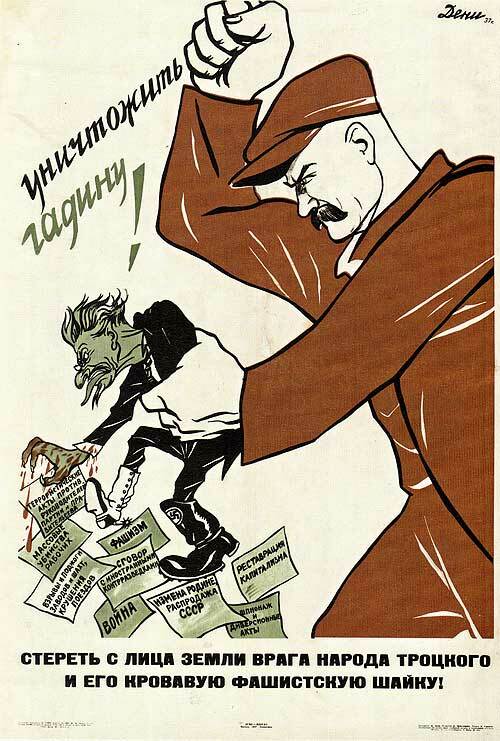 Stalin must be physically destroyed.’ He said that other methods of struggle were now ineffective. He said that for this purpose people were needed who would dare anything, who would agree to sacrifice themselves for this, as he expressed it, historic task. . . . In the evening we continued our conversation. I asked him how individual terrorism could be reconciled with Marxism. To this Trotsky replied: problems cannot be treated in a dogmatic way. He said that a situation had arisen in the Soviet Union which Marx could not have foreseen. Trotsky also said that in addition to Stalin it was necessary to assassinate Kaganovich and Voroshilov. . . .During the conversation he nervously paced up and down the room and spoke of Stalin with exceptional hatred. . . . He said that the terrorist act should, if possible, be timed to take place at a plenum or at the congress of the Comintern, so that the shot at Stalin would ring out in a large assembly.’” (Kahn and Sayers). “…the Soviet bureaucracy is similar to every other bureaucracy, especially the fascist” (Trotsky The Revolution Betrayed). “Fascism is winning victory after victory and its best ally, the one that is clearing its path throughout the world, is Stalinism” (Trotsky L’appareil, 238). “Adolf Hitler read Trotsky’s autobiography as soon as it was published. Hitler’s biographer, Konrad Heiden, tells in ‘Der Fuehrer’ how the Nazi leader surprised a circle of his friends in 1930 by bursting into rapturous praise of Trotsky’s book […] ‘Brilliant!’ cried Hitler, waving Trotsky’s ‘My Life’ at his followers. ‘I have learned a great deal and so can you!’” (Kahn and Sayers 216). “I have never visited Russia and my knowledge of it consists only of what can be learned by reading books and newspapers” (Orwell 366). The anti-Soviet and anti-communist streak of ultra-leftists with Trotskyite leanings such Orwell continues here unabated. After fighting in the Spanish Civil War with P.O.U.M. faction, Orwell fled Spain and submitted names of people he thought were to be communist sympathizers to the British Intelligence service and gave names of people he thought could be trusted to write anti-communist propaganda. “[t]here are 135 names in all…” (Ash). “especially important to anticommunist leftists like Orwell who were convinced, as he himself wrote, ‘that the destruction of the Soviet myth [is] essential if we want to revive the Socialist movement’” (Ash). This list was assembled at the request of the British government. “[O]n March 29, Celia came to visit him in Glouces-tershire; but she also came with a mission. She was working for this new department of the Foreign Office, trying to counter the assault waves of communist propaganda emanating from Stalin’s recently founded Comin- form. Could he help? As she recorded in her official memorandum of their meeting, Orwell ‘expressed his whole-hearted and enthusiastic approval of our aims’” (Ash). “Robert Conquest, the veteran chronicler of Soviet terror, […] shared an office with Celia Kirwan and himself fell ‘madly in love’ with her” (Ash). Notably, Ash reported that George Orwell felt the need to ethnically identify his communist and pro-Soviet comrades for the benefit of their enemies. “One aspect of the notebook that shocks our contemporary sensibility is his ethnic labeling of people, especially the eight variations of ‘Jewish?’ (Charlie Chaplin), ‘Polish Jew,’ ‘English Jew,’ or ‘Jewess’” (Ash). “By providing the US Consulate with information about common enemies, be they Mexican or American communists or Soviet agents, Trotsky hoped to prove his value to a government that had no desire to grant him a visa” (“Revolutionary Democracy”). “Robert McGregor of the [United States] Consulate met with Trotsky in his home…he met again with Trotsky on 13 July…Trotsky told McGregor in detail of the allegations and evidence he had compiled…He gave to McGregor the names of Mexican publications, political and labour leaders, and government officials allegedly associated with the PCM [Mexico and the USSR were the only countries in the world to materially support the fight against Franco’s Fascism in the Spanish Civil War 1936-39]. He charged that one of the Comintern’s [the Communist international’s] leading agents, Carlos Contreras served on the PCM Directing Committee. He also discussed the alleged efforts of Narciso Bassols, former Mexican Ambassador to France, whom Trotsky claimed was a Soviet agent, to get him deported from Mexico…Upon receipt, the State Department transmitted McGregor’s memo to the FBI” (“Revolutionary Democracy”). In addition, the famous Mexican painter Diego Rivera, the husband of Frida Kahlo and good friend of Trotsky, has been revealed as an FBI informant. Despite Rivera being a celebrated “socialist” painter who famously drew a mural of Lenin and Trotsky for the Rockefeller Center in New York City and helped usher in the Mexican Mural Renaissance, like Orwell and Trotsky, incontrovertible evidence exists that Rivera acted as a tool of the FBI. This information was discovered in the archives of the US State Department and FBI documents. “Rivera’s FBI file number was 100-155423 [.…] Reed told the Independent the two academics had also uncovered some very damaging stuff about Trotsky” (Davison). “A second, very serious blow to Mexico’s left came when Trotsky and his Mexican followers disseminated the rumor that communists and Nazis had formed a coalition in Mexico to prepare a coup against the Cárdenas administration in the context of the approaching presidential elections. This rumor had first emerged in the U.S. Congress’s Dies Investigative Committee, and it gained widespread popular attention on October 2, 1939, through a Ultimas Noticias newspaper article with the title ‘Ofensiva Contra los Stali-Nazis.’ It created a pro-Allied propaganda monster that, in the end, almost convinced Allied governments that its own propaganda were fact. In November 1939, the artist and sometimes Communist party member Diego Rivera reinforced existing fears when he stated that Mexico was already in the hands of the ‘Communazis.’ Right away, conservative Mexican anticommunist senators of Mexico’s Congress jumped on Rivera’s bandwagon and demanded the dissolution of the Mexican Communist Party and the denunciation of its members as traitors to the country. Against the background of the Soviet invasion of Finland, they argued ‘that taking orders from Stalin and to agitate in such a manner as to be subversive in character and to undermine the framework of Mexican Governmental procedure’ was un-Mexican! The debate received new fuel on April 13, 1940, this time during the German invasions of the Benelux countries and France. Again, Ultimas Noticias published an article about ‘outstanding members of the Comintern in Mexico.’ Quoting Diego Rivera, a German exile, and other confidential agents as sources, the article claimed that the Comintern’s goal in Mexico was to foment a civil war through agitation, with the intention of distracting U.S. attention from Europe and, subsequently, preventing the United States from entering the European conflict. Most importantly, it claimed again that Russian and German agents were working together to start a revolt in Mexico” (Schuler 144). “Many people were mutual friends of the two [Trotsky & Rivera-Ed], both of them worked in the same organisations such as the American Committee for the Defence of Leon Trotsky (ACDLT). Charles Curtiss was such a friend who sent Trotsky several reports of his meetings with Rivera: ‘During my visit in Mexico, from July 4, 1938 to approximately July 15, 1939, I was in close association with Diego Rivera and Leon Trotsky…I served as an intermediary between them,’ (Writings of Leon Trotsky, 1939-40). Trotsky of course knew of this, thus helping Rivera in supplying information to the FBI…The source relevant to this particular revelation is US State archives – RG 84…According to the Professor [Chase], the information Trotsky provided to the FBI was a means to obtain a US visa. But as the Professor points out, ‘By providing the US Consulate with information about common enemies, be they Mexican or American communists or Soviet agents, Trotsky hoped to prove his value to a government that had no desire to grant him a visa’” (“Laklar”). “Rivera (broke with) Trotsky in 1940. This was a presidential election year and Cárdenas’s choice to succeed him was Manuel Avila Camacho, a former general who was more conservative than Cárdenas and a religious believer to boot. Though Cárdenas had welcomed Trotsky to Mexico, there was a strong Stalinist element among his followers. This faction included labor leader Vicente Lombardo Toledano and…David Alfaro Siqueiros. The Stalinist ring around Cárdenas caused Rivera, much to Trotsky’s dismay, to attack Cárdenas as ‘an accomplice of the Stalinists.’ Rivera also decided to support Avila Camacho’s opponent in the coming election, a general named Juan Andrew Almazán. Almazán was even more right-wing than his opponent, promising to bring the unions into line and enjoying the backing of Mexico’s neo-Nazi movement” (Tuck). One of the most controversial charges leveled against Leon Trotsky is that in addition to calling for the destruction of the Soviet Union and betraying communists, he collaborated with the fascist Axis powers. The best sources of information for this charge are the second and third Moscow Trials, which contain the testimonies of members of the Trotskyite Bloc from the years 1936, 1937 and 1938. Of course, the Moscow Trials are universally labeled by Trotskyites and other anti-communists as “show trials” brought about by fabricated evidence and torture of the defendants. The American Party of Labor would like to point out that there is no evidence whatsoever of torture being used on the defendants, nor of their families being threatened. Because of these common charges however, the Trials have been dismissed out-of-hand and disregarded entirely, and thus all evidence of Trotsky’s collaboration is by association, dismissed. The fact is that a great deal of evidence exists to prove that Trotsky and his followers did collaborate with the Axis powers. “Trotsky put the question in this way: the accession of Fascism to power in Germany had fundamentally changed the whole situation. It implied war in the near future, inevitable war, the more so that the situation was simultaneously becoming acute in the Far East. Trotsky had no doubt that this war would result in the defeat of the Soviet Union. This defeat, he wrote, will create favorable conditions for the accession to power of the bloc…” (Radek 239-40). “Hitler’s soldiers are German workers and peasants…The armies of occupation must live side by side with the conquered peoples; they must observe the impoverishment and despair of the toiling masses; they must observe the latter’s attempts at resistance and protest, at first muffled and then more and more open and bold…The German soldiers, that is, the workers and peasants, will in the majority of cases have far more sympathy for the vanquished peoples than for their own ruling caste. The necessity to act at every step in the capacity of ‘pacifiers’ and oppressors will swiftly disintegrate the armies of occupation, infecting them with a revolutionary spirit” (Trotsky, Writings 113). “safe contacts in Berlin, Prague, and Istanbul” (Getty 28). “January 1937 Trial defendants Piatakov, Radek, Sokol’nikov, and Shestov all testified to having been given explicit instructions by Trotsky himself concerning collaboration by either Germany or Japan” (Furr 58). In the trials, the defendant Natan Lur’e claimed he had received orders and instructions from the Gestapo, Pyatokov claimed that Trotsky gave a directive to collaborate with and seek support from the “most aggressive” foreign states, including Germany and Japan, for otherwise the bloc could not come to power or hold it. In addition, Trotsky claimed he had already begun establishing the necessary contacts with the Germans and the Japanese by that time. There are also the testimonies from Radek, Sokol’nikov, Krestinsky, Rozengol’ts, Rakovsky, Bessonov, Shestov and Romm that testify to such activities. “[O]nly a short while ago in one of the divisions of the Eighth Revolutionary Peoples’ Army, a man by the name of Yu Shih was exposed as a member of the Shanghai Trotskyist organisation. The Japanese had sent him there from Shanghai so that he could do espionage work in the Eighth Army and carry out sabotage work. In the central districts of Hebei the Trotskyists organised a ‘Partisan-Company’ on the direct instructions of the Japanese headquarters and called it a ‘Second Section of the Eighth Army.’ In March the two battalions of this company organised a mutiny but these bandits were surrounded by the Eighth Army and disarmed. In the Border Region such people are arrested by the peasant self-defence units which carry out a bitter struggle against traitors and spies” (Mao, quoted in “Revolutionary Democracy”). “[Comrade] Leon Trotsky has told for the first time the story of how the ‘Tanaka Memorial’ was secured by the Soviet intelligence service from the archives of the Japanese government” (Trotsky, The ‘Tanaka Memorial’). “[…] the writer of these lines is able to vouch for the following facts. The ‘Tanaka Memorial’ was first photographed in Tokio [sic] in the Ministry of Naval Affairs and brought to Moscow as an undeveloped film” (Trotsky, The ‘Tanaka Memorial’). He goes on to say he was one of the first persons to see this film and the translations of the resulting transcription of the Japanese war plans. Trotsky also tells that the USSR had the document published through the American press, admitting to the world that the USSR has spies in Japan and leaked Japanese war plans to the United States. “From Dzerzhinsky I learned that the GPU enjoyed the services of a very trusted functionary who had direct access to the secret archives of the Japanese Ministry of Foreign Affairs. In a period of more than a year he had already provided some very valuable information and was marked by great precision and conscientiousness in fulfilling his obligations as a foreign spy. [….] Why do the Japanese authorities pronounce the ‘Tanaka Memorial’ a Chinese forgery? They were obviously unaware of Moscow’s role in the publication of this document” (Trotsky, The ‘Tanaka Memorial’). “the creation of an anti-Bolshevik bloc in the pre-October period, the formation of factions in the Party in the twenties, anti-Republican maneuvers in the years of the Civil War in Spain, actual co-operation with the forces of fascism on the eve of the Second World War [as well as] provocations in Peru between 1963 and 1966 and in France in 1968” (Basmanov). The Trotskyite stances on the Islamic Republic of Iran and the Democratic People’s Republic of Korea for example, are identical to those of the American government and right-wing reaction. Right-wingers, from the Tea Party Protestors to John McCain, support the “mass uprisings” in Iran, and so do Trotskyites. Right-wingers despise the Jucheist state of the DPRK, and that’s right, so do the Trotskyites. Right-wingers think Stalin was a bloodthirsty dictator and yes, so do the Trotskyites. Two articles by the Trotskyite sect Solidarity should demonstrate this. An article on their website, supposedly on the US imperialist occupation of South Korea and the puppet government there, spends over half the article smearing the Democratic Peoples’ Republic of Korea in the north: “A longer-term result of the Soviet collapse has been the removal of the obstacle of Stalinism” (Sheppard). “[The North Korean leadership] increasingly adopted a personality cult around Kim Il-sung. The regime is among the worst Stalinists in terms of opposition to workers’ democracy and political strategy. They don’t understand that South Korea is capitalist, for example…[they] orient toward a mythical struggle against feudalism, claiming that South Korea is semi-feudal” (Sheppard). “We would like to have contact with North Korean workers, but there is no dissident group of revolutionary workers. What dissidents there are have no base in the working class. Workers so far are absolutely controlled by the party” (Sheppard). “It should go without saying that socialists anywhere in the world must stand on the side of the Iranian popular democratic resistance to election fraud, violent repression and tyranny” (“Crisis, Repression and Coup in Iran”). “The U.S. ruling class has no role to play in the struggle for Iranian democracy and freedom” (“Crisis, Repression and Coup in Iran”). all without citing a single source for such things. “Crisis, Repression and Coup in Iran.” Solidarity-us.org, 01 Jun 2009: n. pag. “The Stalin School of Falsification Revisited.” Workers Vanguard. 22 June 1973, No. 23-30. Print. “Trotsky and the FBI.” Red Youth, Laklar. (March-April 1997): Print. “Trotskyism Revisited.” Revolutionary Democracy 3.2 (1997): n. pag. Web. Ash, Timothy. “Orwell’s List.” New York Review of Books 25 Sept. 2003: n. pag. Web. Davison, Phil. “Diego Rivera’s Dirty Little Secret.” Independent 25 Nov. 1993: Print. Furr, Grover. “Evidence of Leon Trotsky’s Collaboration with Germany and Japan.” Cultural Logic. (2009): 58-161. Print. Hearse, Phil. “Tony Cliff — a Life For Revolution.” Green Left Weekly 19 April 2000: Print. Lenin, V.I. “Lenin to Inessa Armand.” Labour Monthly Sept. 1949, Print. Ruhle, Otto. “Which Side To Take?” Living Marxism. 5.2 (1940): Print. Sheppard, Barry. “Korea’s New Revolutionaries.” Solidarity-us.org. Aug. 2000. Solidarity, Web. Trotsky, Leon. “Mezhrayontsi Conference.” May 1917, quoted in Lenin, Miscellany IV, Russ. ed. 303. Print. Trotsky, Leon. “Statement from Interview with William Randolph Heart’s New York Evening Journal.” New York Evening Journal 26 Jan. 1937, Print. Trotsky, Leon. “The Class Nature of the Soviet State.” Trotsky Internet Archive. 01 Oct. 1933. Web. Trotsky, Leon. “The Indissoluble Tie between the Comintern and the GPU.” Fourth International. 1.6 (1940): 102. Print. Trotsky, Leon. “The ‘Tanaka Memorial’.” Fourth International. 2.5 (1941): 131-135. Print. 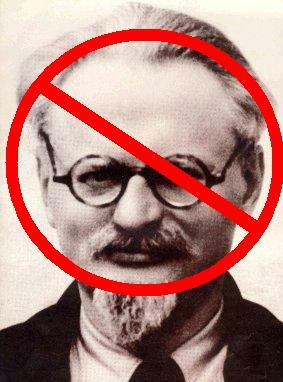 Trotsky, Leon. Caïn Dugachvili va jusqu’au bout . 1938. 238. Print. Trotsky, Leon. Trotsky’s Diary in Exile. Cambridge: Harvard University Press, 1958. 46. Print. Tuck, Jim. “Rebel Without a Pause: the Tempestuous Life of Diego Rivera.” Mexconnect 09 Oct. 2008: Print.